Marble top table and a wooden bench. Marble top table (29" diameter x 27" tall) has been repaired and needs repair again, but the wrought iron base is in nice condition. The hefty wooden bench (37 x17 x 18" tall) is in nice condition but needs tightening up. ITEM SHOWS NO PRIOR USE AND LOOKS GOOD. American Standard has created products with never-let-you-down performance and built-to-last quality for 150 years, making everyday life better and more beautiful. 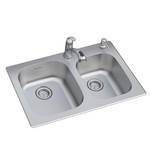 The Sullivan stainless steel double-bowl sink comes with a convenient PULL-OUT FAUCET and soap dispenser. Crafted of durable 20-gauge stainless steel, the sink has SoundSecure+ sound pads for reduced noise and StoneLock+ undercoating ensuring vibration and condensation protection. Single-handle swivel faucet features pull-out spray head. Includes two sink strainers. Providing practical storage where it matters most, the Hampton Bay Select MDF 3-Door Wall Cabinet is the perfect addition to your home. 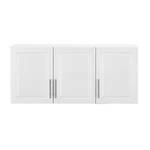 Featuring a classic white finish for simple style, this 3-door cabinet was designed to fit above your standard washer and dryer. Its 12 in. deep design provides ample clearance for typical laundry duties like loading and sorting. Inside, three adjustable shelves store laundry supplies and other needed items. Part of the Elite Collection, this versatile unit is also ideal as a stand-alone piece for offices or workshops. 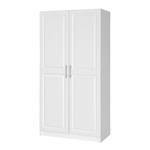 Classic white finish with European-style. Perfect for the office or home. Large space for storing your clothes.